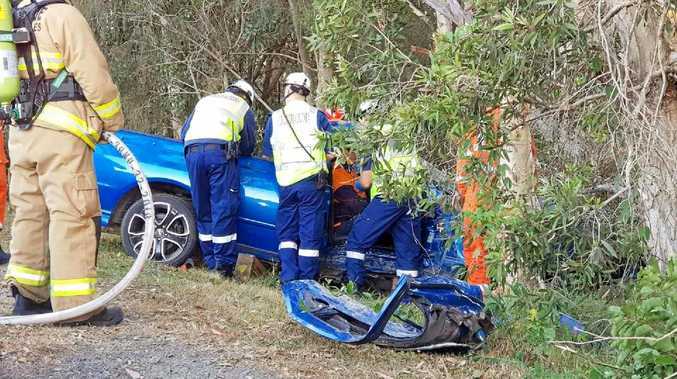 A MAN has suffered serious leg and shoulder injuries after his ute crashed into a tree this morning, leaving him trapped in the vehicle for more than an hour. The 37-year-old driver hit a tree at high speed on Hogbin Dr opposite the Coffs Harbour Education Campus just after 6am this morning. The door of the ute slammed into the tree, leaving the driver trapped by his legs. Emergency service teams retrieved the man from the vehicle and transported him to hospital in a serious but stable condition.